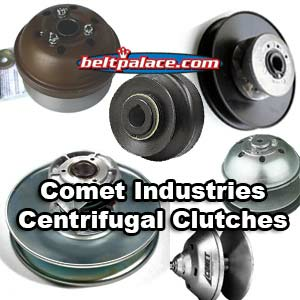 Belt Palace now offers a selection of torque converters, centrifugal clutches and parts for your Comet, Murray, Manco, Yerfdog, and Carter Brothers Go Karts on our online store. (Belt and Chain Drive Systems). Replacement Comet Belt and Chain drive clutches. Call (317) 519-9020 to order any Comet Industries parts not shown on our website. We stock many hard-to-find, vintage CPC Spirit, Salsbury, Hoffco-Comet parts not yet listed online! Comet Industries Go Kart CVT Clutches are now available for both Belt Drive CVT systems and Chain Drive clutch systems. CLICK HERE FOR COMET INDUSTRIES GO KART-UTV-SNOWMOBILE-ATV BELTS ONLINE. Need to stretch your budget? No problem! Use "PayPal Credit" at checkout! Up to 6 Months Same-as-Cash. See terms for details. COMET CLUTCHES & PARTS ARE MADE IN USA! Comet 010961A Brake Drum with External Hub. 1" Bore, 4.2" Diameter. Comet 202154A - OEM Heavy Duty 9 Tooth Sprocket on TAV Series Comet Industries, 5/8” Bore, #40/41 Chain. Replaces KENBAR/MANCO 1125. Comet 202168A Replacement Sprocket. Comet Industries 10 Tooth Sprocket for #40/#41 Chain (1/2” pitch), 5/8” Bore. Kenbar 300-024, Baja Motorsports BB65-401, Comet Industries/Hoffco 202168-A. Package of (2) Comet 202299A "Black" 350 Series Clutch Springs provides approximately 3100-3300 RPM engagement. Comet 203973A Chain Sprocket Centrifugal Clutch. 12 Tooth, 40/41 Chain. 3/4" Bore, 12 teeth. Max. 8HP. 4 cycle engines only. Comet 204177A - SPIRO-LOX Retaining Ring. CAT-99/TC-88 Replacement Spirolox Retaining ring. Comet 204495A. "2 Pack" Comet Industries 204495A Clutch Shoes. 3-1/2" Clutch Shoes. Replaces: Comet 204495-A. Comet 205857A "Black" Spring Kit for 94C Duster Drive Clutch. Comet 206143-A Activator Pucks for 94C Duster, 3/4" Hole, Smooth Cover, 20 Grams. Sold as a Package of 3 pucks. Comet 206515A. Activator Puck 3-Pack For 94C Comet Duster. Sold as One Package of 3. Must be used with matching "SMOOTH" cover design. Comet Industries 207915A. Replaces obsolete Salsbury driven clutch 207915-A/C. These are new build models using Green Cam Spring, INBOARD mount only. Comet 209620A. 40/44 Series Movable Face and Cam with Bearing. Cam buttons included! 8-1/2" Dia. Comet 209831A - Keyway for 780 Series (302405A) CVT Drive Clutch. ”Brown” Spring LH Wind. Requires INBOARD Mount. Optional Reverse spring available for Outboard Mounting on King Midget Cars and others. Call for Availability. Hoffco-Comet 213552-S Bronze Bushing. 7/16" ID. Comet 212631A. Red Cam Spring for Comet 94C "Duster" Clutches. OEM PART: 212631A, SPRING-RED 94C. Comet 214707A, 94C Duster Drive Clutch. 1" Straight Bore. Ribbed Cover for High Load Use. Comet 215558A: 2-Pack TAV2 BEARING Kit for Comet Industries Torque-A-Verter. Comet 215558A - 2-Pack TAV2 BEARING Kit for 30 Series Comet Industries Torque-A-Verter. Comet 215650A Fixed Cam face for 20/30 Series Driven Unit (20 Degree). Comet 215650A Fixed Cam face for 20/30 Series Driven Unit (20 Degree). Comet Industries Replaces OEM Torq-A-Verter 215650-A (See Parts Diagram #5). Comet 215852-C Green Cam Spring. Cam Spring for Cub Cadet unit 216709-C Driven/Secondary Pulley. Comet 216308A, Comet 94C Duster drive clutch. Ribbed cover for high load use. 1" bore - 1/4" key. Use 1-3/16" wide belts. Comet 217490A, Comet Industries 94C Duster drive clutch. Ribbed cover for high load use. 1-1/8" bore - 1/4" key. Use 1-3/16" wide belts. Comet 217557A Secondary Pulley. New OEM Lennartsfors/Jonsered PART, 20 DVN, 17mm Bore, 7" Dia. Driven Pulley. Comet 218229C Steel band brake with ceramic lining. 4.3" Diameter. Fits most 4" Comet Industries drum brake systems. Comet 218983A Drive Clutch for Yamaha. Comet 218676A 44C Primary Drive Clutch. 1" Bore, modified to use only 3/4" Wide Belts. Replaces Lennartsfors 5310199-34 Primary variator EX9094 (44C 9HK IH EX9094-44C, 1-inch/25.4mm Bore). "PRIMARVARIATOR 9HK EX9094 44C"
Comet 219204-A (Kenbar 300-004) # 4 - Drum for 20 Series, 30 Series, and TAV Driver. TAV2 part 219204. Comet 219205A Movable Face, 30 Series. 3/4" Bore. Comet 219463A Driven Clutch (Assembled). Replaces OEM Model# 21-D. 6” Dia. with 3/4" BORE. REPLACES Previous Comet 217776A clutch. Comet Industries part 219463A replaces worn out or broken Driven clutches on Comet 20 Series systems used on Manco, American Sportworks, Murray, Stens, Kartco, and Salsbury clutch assembly. This fully assembled Driven (axle) or “Lower” Clutch is the Comet replacement part #219463A (previously 217776A ) for Comet/Hoffco/Salsbury clutches on Go Carts, Golf Carts, and Mini-Bikes. Comet 219573A (20 Series) Fixed Face and Post for Comet Industries 219559A and 219573A Drive Clutch assemblies (3/4" bore). Comet 219656A - Comet (72C) Series Drive Clutch for Yamaha Golf Cars, UTV, ATV’s. 30mm, 1:10 Taper Bore. Comet 300139-A. Package of (1) Comet Industries 500/780 Series Roller Weight Arm (91 grams). Comet 300148A - 72 Gram Roller Weight Kit for 780/500 Series Comet Industries Drive Clutch. Comet 300148A - 72 Gram Roller Weight Kit for 780/500 Series Comet Industries Drive Clutch. Comet Industries 300148-A. Comet 300165A Roller Weight Kit. 68 grams each. Package of 3. Comet 300168A: RAMP PLATE 500 or 780 DRIVER. Comet 300168A. RAMP PLATE FOR 500 OR 780 SERIES DRIVE UNIT. Comet 300208A - Compression spring for Comet/Salsbury 770/780/790/858 Series secondary pulleys. Comet 300224A Cam Spring for 302287C, 301826A Driven. 130 lbs Tension, Left Hand Wind. Comet 300315A SPRING FOR 858 Series TORQUE CONVERTER - "NATURAL" COMET 858 DRIVEN Clutch. Comet 300315A Spring for Comet 858 Series Driven Clutch. Replaces bent or broken springs from Driven Clutch for Comet 858 Torque Converter Systems. "Natural". Comet 858 Driven Clutch (Natural Spring). Comet 300373A - 780 Series Retaining Ring. Ridley Part# 13309. Comet 300382A. 700/780 SERIES MOVEABLE FACE & BUSHING FOR FL-250 ODYSSEY (Model 300704A). Comet 300397A - RED Cam Spring, Salsbury Part 704483. Comet 300397A - "RED" Cam Spring for Comet Industries/Salsbury Secondary Clutch. Comet Industries 300397-A. Salsbury Part 704483. MutiQuip/Whiteman Secondary CVT Cam Spring for Ride on Trowels, etc. Comet 300401A "Yellow" Cam Spring for 500/770 Series Driven Unit. Comet 300418A Primary Drive Clutch, 1" Straight Bore, set for 1800 RPM Engagement, 500 Series (15/16" Wide Belts). Comet 300422C Secondary Pulley. 770 Series. 1" Bore. Comet 300672C CVT BELT for TC88. Replaces Salsbury belt 704136. Comet 300707C (John Deere AET10637) AMT 300707C Secondary Clutch. Comet 300707C (John Deere AET10637). Comet Industries 860 Series Driven Clutch. 3/4" Bore. Comet/Salsbury/John Deere AMT Secondary Clutch 300707C. Comet 300782-C Secondary Pulley for Land Pride, Recreatives Industries Max ATV-UTV's, and more. Comet 300794A Driven Clutch for 84-87 Club Car Golf Cars. Comet/Salsbury 510 Series: 8-1/2" Dia., 7/8" Bore, 15/16" W Belt. Comet 300798C. Comet/Salsbury 770 Driven Pulley, 1" Bore. 1/4" keyway. Comet 300798-C. Comet/Salsbury 770 Driven Pulley, 1" Bore. 1/4" keyway. Use with 1-3/16” Top Width Belts. Genuine COMET INDUSTRIES part Made in USA. Comet 301221A. Comet Industries 500 Series Driven Clutch. 1" Bore. 1/4" Key. Comet 301221A. Comet Industries 500 Series Driven Clutch. 1" Bore. Comet/Salsbury/Brister's Part 301221-A. Comet 301289C Driven Clutch Unit. 1" Straight Bore. Comet 301289C Secondary Clutch. Comet Industries DVN 8-1/2"Dia, 1" Straight Bore - 1/4" Keyway, High tension cam spring. Requires 1-3/16" Top Width Belts. OEM for Superior Walk-Behind Trowel. Comet 301730A - 88 Gram Roller Weight Kit for 500 Series Comet Industries Drive Clutch. Comet 301730A - 88 Gram Roller Weight Kit for 500 Series Comet Industries Drive Clutch. Comet Industries 301730-A. Comet 301759A - 106 Gram Weight Kit for Comet Industries Drive Clutch. Comet 301759A. 106 Gram Weight Kit for Comet Industries Drive Clutch. Comet Industries 301759-A. Comet 301768A Driven Clutch. Comet 500 Series, 7-1/2" Diameter Pulley, 3/4" Straight Bore with 3/16" Keyway. Comet 301793C Drive Clutch, 780 Series. 1450 RPM Engagement. Comet 301796C Driven Clutch. 770 Series. 3/4" Bore. Comet 301796C Driven Clutch. OEM Replacement 770 Series for Textron Jacobsen & Cushman Utility Vehicles. Comet 301826A Driven Clutch for Odyssey FL350 Secondary Pulley. Salsbury-Comet 790 Series. Comet 301875A - 510 Series Comet Drive Clutch. 30mm Taper Bore. OEM replacement for Hyundai Golf Cars (Select Models). Comet 301940A Secondary Pulley for Land Pride Treker UTV's. Comet 301940A Secondary Pulley. 7/8" bore, 9.25" dia., 3/16" Keyway. Use only with Comet Industries 1-3/16" top width belts. OEM for Select Land Pride Treker UTV's. Salsbury 780 Series. Comet 302284C. C-500 Drive Clutch. Comet 780 Series Drive Clutch, 1" Bore, 1600 RPM Engagement. Comet 302287C. Comet Industries/Salsbury 790 Series Driven Clutch. 7/8" Bore. Comet 302287C. Comet Industries/Salsubry 790 Series Driven Clutch. 7/8” Bore, 8.5” Diameter. Comet/American Sportworks-ASW/Salsbury Part 302287-C.
Comet 302288A - 780/500 Series Drive Clutch replacement Spring Kit, Six (6) Red 302288-A Springs. Comet Industries 302288 RED Spring Kit. Comet 302292A - 500/780 Series Drive Clutch replacement Spring Kit, Six (6) Yellow 302292-A Springs. Comet 302296C. Comet Industries Driven Clutch for Cushman Golf Cars and others. Replaces Manco 9457 (Obsolete) DRIVEN PULLEY 780S /302296. Comet Industries 302353C OEM Drive Clutch for Walk Behind Trowels and UTV's. Multiquip Part No: 11535. COMET 302358C. MultiQuip HDA Series 11536 Secondary Pulley. COMET 302358C. MultiQuip HDA Series 11536 Secondary Pulley. 13HP Honda Assembly. Spline Liner Kit for 340 Drive Clutch. Comet 302373-A. Comet 302392A Driven Pulley for '88-'96 Club Car. Comet 302393A Primary Clutch with Alternator Pulley. Comet 302393-A Primary Clutch. Club Car OEM Salsbury 858 DRIVE, 30mm Bore, 1:10 taper. 5-1/2" dia. pulley on the back. Uses 15/16" W belts. Fits select Club Cars 1988-1991. Comet 302437A. Comet Industries 858 Series Driven Pulley. 8-1/2" diameter, 3/4" Bore. Comet/Salsbury/Brister's Part 302437A. Comet 302470-C Primary Clutch for Land Pride (Treker) UTV. Comet 790 Drive Clutch, 1" B, 1550 RPM for Land Pride Utility Vehicles. Comet 302479C. OEM MultiQuip 12879 Driven/Lower Pulley unit. Comet 302479C. OEM MultiQuip 12879 Driven/Lower Pulley. OEM MultiQuip HHN-31V Drive Assy No# 8, Part# 20350, Part Name: PULLEY, CVT LOWER, COMET 302479C. COMET 302525CC02 Primary Clutch. 1190 Series. 1-7/16" Bore. COMET 302525-CC02 CLUTCH, CVT 1-7/16 DIA. COMET #302525CC02. Replaces Whiteman/MultiQuip Manufacturer Part No: 20846. 21473 Description: CLUTCH, CVT 1-7/16 DIA. COMET #302525CC02, MultiQuip HHN Trowel Part, Drive-Primary. Comet 1190 Series. Requires 1-7/16" Belt, 1-7/16" Shaft (Bore). Comet 302529C Secondary Pulley. 780 Series. 9.25" Diameter. 3/4" Bore. Comet 302533C, Comet-Salsbury 1190 Series Primary Clutch. COMET 302538C DRIVEN PULLEY, CVT LOWER (COMET 302538-C). 1” Bore. Comet 302603C. Comet Industries 790 Series Driven Clutch. 3/4” Bore. Comet/Salsbury Part 302603-C.
Comet 302603C. Comet Industries/Salsubry 790 Series Driven Clutch. 3/4" Bore, 8.5” Diameter. Comet/Salsbury Part 302603-C.
Comet 302610C. Comet Industries 780 Series Drive Unit. 1" Bore. Comet 302610C. 780 Series Drive Unit. Stock 1700RPM Engagement. 1" Straight Bore. Requires 1-3/16" Wide belt. Comet 302647C. Comet Industries 780 Series Drive Clutch, Custom Engagement, Dust Cover. Comet OEM Part 302647-C.
Comet 302649C Driven Clutch. Comet Industries 770 Series Driven Clutch (Lower Pulley): 7/8” bore. Comet 302649C Driven Clutch. Used in Feterl Pug ATV/UTV’s and others. Comet Industries 770 Series Driven Clutch: 32 Cam, Green Spring, 7/8” bore. Requires 1-3/16” top width belt. 1700 rpm engagement. Made in USA by Comet Industries. Comet 302680C. Drive Clutch, 1190 Series. 1-1/8" Bore. Comet 302680C Drive Clutch for Concrete Trowel Machines. Comet/Salsbury 1190 Series. OEM Primary Clutch 302680-C for Whiteman/MultiQuip. Comet 302690-C (Ariens) Drive Clutch for Land Pride Treker UTV. >> SEE COMET 302405A. Comet 302693-C - 3-Pack of "302656C” Heavy Duty Insert Buttons on 780 Series Comet Industries Driven Clutch (fits Comet Industries 301940C). Comet 302752C. Comet Industries 1190 Series DRIVEN, 1" Shaft, 9.84" Dia., BROWN SPRING, 1-7/16” BELT.